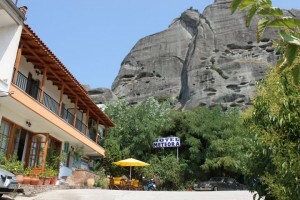 Situated in the old town of Kalampaka, Alsos House provides a relaxed and friendly base with breathtaking views of Meteora, and is very close to the local hiking trail. There are a variety of guest rooms available at Alsos House, catering to the needs of solo travellers, groups of friends and families. 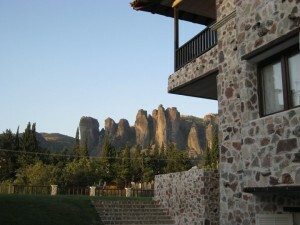 Each one is comfortably furnished and features stunning views of Meteoras rocks. Start each day with a complimentary breakfast or make your own packed lunch in the convenient communal kitchen. Check your emails using free wireless internet access, whilst the children play in the playground. 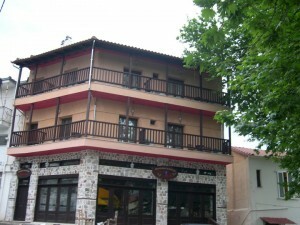 The friendly owners of Alsos House provide local guides for daily tours to the rocks and monasteries. They are also happy to arrange guides for small groups of hikers wishing to explore the ancient monk paths. General: 24-hour front desk, Terrace, Non-smoking rooms, Facilities for disabled guests, Family rooms, Express check-in/check-out, Heating, Luggage storage, Ski storage, Air conditioning, Sun terrace. 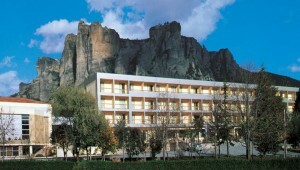 Activities: Children’s playground, Hiking, Cycling. 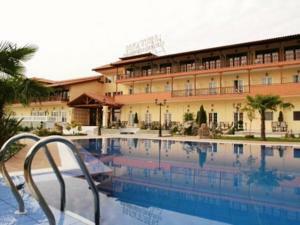 Services: Laundry, Breakfast in the room, Ironing service, Car hire, Tour desk, Fax/photocopying.